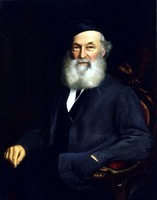 EWART (Euart), JOHN, architect, builder, and businessman; b. 31 Jan. 1788 in Tranent, Scotland, son of William Euart and Margaret Dobson; m. 1810 Jane Wilson of the parish of Cranston, Scotland, and they had 11 children; d. 18 Sept. 1856 in Toronto. By 1810 John Ewart had completed his apprenticeship in the building trade and had qualified as a free craftsman. Presumably he was employed on construction projects in Edinburgh’s New Town but after 1811, like many other ambitious Scottish builders, he moved to London, possibly in the hope of securing lucrative commissions or recognition as an architect. The death there of two of his children, and the building recession which followed the Napoleonic Wars, may have led to his decision to emigrate with his family to New York City about 1816. Within three years the Ewarts had moved to York (Toronto), Upper Canada. Although the town’s building needs following the War of 1812 had attracted “many good tradesmen,” Ewart was quickly recognized as a builder of some accomplishment and found work almost at once. 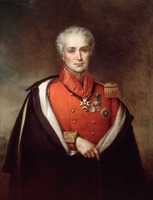 His first recorded building contract was for the York Hospital (1819–20), a plain, Georgian-style structure which was well within his competence as a designer, but it was almost certainly planned in consultation with Dr William Warren Baldwin*, a prominent physician and lawyer. The provincial parliament building of 1818, the hospital, and St Paul’s constituted the capital’s few scattered monuments in 1824. (The wooden Anglican church and outlying Fort York, built largely of log and brick, counted for little.) As an urban complex the town fell miserably short of London, England, whose architectural panache Ewart remembered so well. 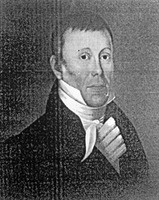 Dignified buildings, particularly a concentration set in public space, were needed and, in William Warren Baldwin, he found an influential townsman who shared his conviction and sometimes helped him to realize it. 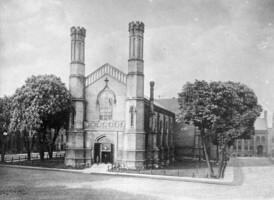 The Home District court-house and jail were planned by Ewart in 1824 (with some features based on Baldwin’s legal experience) and erected as a pair of pedimented brick buildings, set back from King Street and toward either side of a square bounded by King, Toronto, Newgate (Adelaide), and Church streets which had been laid out by Ewart. The architectural quality of the two buildings and the siting suggest that Ewart anticipated the construction of a majestic central edifice, a version of which was later designed by John George Howard* but never built. The northern face of the square was soon completed by the erection of two churches of harmonious form: Robert Petch’s Newgate Street Methodist Chapel, backing on to the jail’s yard, and St Andrew’s Church, designed in 1830 by Ewart, a member of that Presbyterian congregation, and set behind the court-house. For this design, executed in time for the arrival of the Reverend William Rintoul, he evidently used architectural features derived from the Regency work of John Soane in Britain: tall pilasters, untrimmed window openings, crisply incised linear panelling of the exterior walls, and, at roof level, stilted acroteria (some of which contained chimneys). The square was a brave attempt to combine law and order, religion, and urban amenity in the commercial heart of the town. Ewart’s second court-house, designed in 1827 for the London District of Upper Canada, differed markedly from its counterpart in York. An open and uneven site located between the proposed town of London and the Thames River suggested a feudal ambience and hence the use of stone, but economy dictated brick. Financed by the mercantile firm of Thomas Clark* and Samuel Street*, the court-house was a Regency Gothic building, reminiscent of James Wyatt’s Royal Military Academy in Woolwich (London), England, which had been newly built when Ewart arrived there. The court-house, a rectangular building with a buttressed, octagonal tower at each corner, was and still is a picturesque but functional structure, designed to complement a rustic setting by one who understood the Romantic prelude to the Victorian Gothic revival in architecture. In 1826 Ewart had made an unsuccessful bid for a much debated architectural plum: designing a replacement for the parliament building, which had burned two years earlier. Plans were submitted by Ewart, Baldwin, John Ford, and Joseph Nixon, who won the competition – an empty triumph as plans were later provided by Thomas Rogers of Kingston. The nature of Ewart’s design is not known but, as a builder, he retained an interest in York’s grandest public building; following the failure of the contractor, Matthew Priestman, Ewart and Thomas Parke* became the first overseers of construction for the complex, which opened in 1832. The plans which Ewart apparently provided for Upper Canada College, built at York in 1829–30, are lost. His last known commission, a complex of three pavilions named after William Osgoode*, was undertaken in 1829 for the Law Society of Upper Canada; one pavilion, a parapetted brick building, was built and the following year a lateral dormitory was added. Although most of Osgoode Hall’s Regency features were subsequently masked by the remodelling and additions of Henry Bowyer Joseph Lane and the firm of Cumberland and Storm, Ewart’s smooth, spare trim still curves around the original entrance. Trim of the same plasticity, so characteristic of his work, also informs the doorway of the Bank of Upper Canada, begun at the corner of Duke (Adelaide) and George streets in 1825. This was probably another result of the successful collaboration between Ewart, who understood the design of buildings, and Baldwin, who recognized the architectural needs of York. After 1830 Ewart abandoned active design work. The architectural styles best known to him were becoming increasingly unfashionable and he may have begun to suffer from the bane of many builders, hardening of the leg arteries (he was to die of gangrene). He nevertheless maintained a building yard and a wharf until his death. His highly lucrative construction trade was probably carried out by subcontractors, an arrangement which evidently enabled him to return frequently to Great Britain and to New York on business. In Toronto he remained prominent in several institutions and enterprises, and within the city’s architectural community. He was a life-long trustee of the York General Burying Ground (laid out in 1826), first president of the York Mechanics’ Institute in 1830, a founding member six years later of the benevolent St Andrew’s Society of Toronto, and president in 1840 of the Toronto Cricket Club. 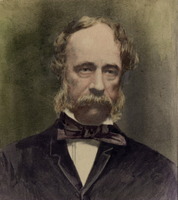 An extensive property owner and proponent of Toronto’s development as a major transportation terminus, he was a founding director in 1837, along with William Allan and others, of the City of Toronto and Lake Huron Rail Road Company, with which he was involved for some ten years; in 1843 he prepared experimental designs for road-beds. In 1841 Ewart, Robert Sympson Jameson, Dr William Charles Gwynne*, and William Botsford Jarvis* were named to a board to superintend the province’s temporary lunatic asylum [see William Rees*]. Four years later, with a group of other builders and architects (including Henry Bowyer Joseph Lane, Thomas Storm, and William Thomas), he also served on a committee chaired by William Henry Boulton* to form a building and loan society. Of John Ewart’s eleven children, seven lived to maturity; none followed him as a builder or as a designer. Two sons, John and George, took up mercantile activities in Toronto, much of their backing coming from their father. Following Ewart’s death his financial worth was estimated at £100,000. His mantle of public service fell to a daughter, Jane, the wife of Sir Oliver Mowat*, and to a grandson, John Skirving Ewart*, a distinguished lawyer and author who died in 1933. An unsigned study of shops for Market Lane, Toronto, attributed to John Ewart, is preserved in MTL, J. G. Howard papers, sect.iii, architectural plans, no.410. AAT, Ser.1, AB01.07. AO, RG 22, ser.155, will of John Ewart. BLHU, R. G. Dun & Co. credit ledger, Canada, 26: 64, 350. GRO (Edinburgh), Tranent, reg. of baptisms, 31 Jan., 10 Feb. 1788. MTL, William Allan papers, City of Toronto and Lake Huron Rail Road Company papers, John Ewart, reports to the president and directors, 1 Aug., 6 Dec. 1845; J. G. Howard papers, sect.ii, diaries, 19 July 1841; 3, 8 May 1843; 18 April–2 May 1845. PAC, RG 5, A1: 41612–14, 54861–62, 57196–211, 58629–41, 69561–67, 69814–18, 73396–97, 74105–10, 77624–26, 87344–46, 119540–41. Private arch., Janet Fitzgerald (Toronto), Ewart family papers and records. Toronto Necropolis and Crematorium, Reg. of burials. UWOL, Regional Coll., Vertical file, no.412 (London, Court-house and gaol, corr. and accounts relative to building, 1826–28). Town of York, 1815–34 (Firth), 41–42, 324n. U.C., House of Assembly, Journal, 1831–32, app. : 96–99; Statutes, 1836, c.5. Examiner (Toronto), 9 Sept. 1840, 6 Oct. 1844. Globe, 2 Dec. 1845. Leader, daily ed., 20 Sept. 1860. Toronto Patriot, 28 Feb., 21 Aug. 1840; 10 Aug. 1841;15 Oct. 1844. Alfred Sylvester, Sketches of Toronto, comprising a complete and accurate description of the principal points of interest in the city, its public buildings . . . (Toronto, 1858), 23, 29, 36, 56–57. Toronto directory, 1833–34: 11; 1846–47: 24, 36. [G. P. Ure], The hand-book of Toronto; containing its climate, geology, natural history, educational institutions, courts of law, municipal arrangements, &c.&c, by a member of the press (Toronto, 1858), 171, 268. Eric Arthur, Toronto, no mean city ([Toronto], 1964), 65. C. K. Clarke, A history of the Toronto General Hospital . . . (Toronto, 1913). Hist. of Middlesex, 91. Law Soc. of U.C., Osgoode Hall: a short account of the hall, issued by the Law Society of Upper Canada, 1832–1932 (Toronto, 1932), 8. MacRae and Adamson, Cornerstones of order. MacRae et al., Hallowed walls, 85. Middleton, Municipality of Toronto, 1: 440; 2: 746–47. Robertson’s landmarks of Toronto, 4: 121. C. T. Campbell, “The beginning of London,” OH, 9 (1910): 73. Marion Bell MacRae, “EWART, JOHN,” in Dictionary of Canadian Biography, vol. 8, University of Toronto/Université Laval, 2003–, accessed April 20, 2019, http://www.biographi.ca/en/bio/ewart_john_8E.html.